We’ve just released the third alpha of Graylog v2.0. If you missed the previous alphas, check out blog post 1 and blog post 2 to get caught up on the new features that we’ve already announced. This third alpha release includes three new features, in addition to some bug fixes and improvements. 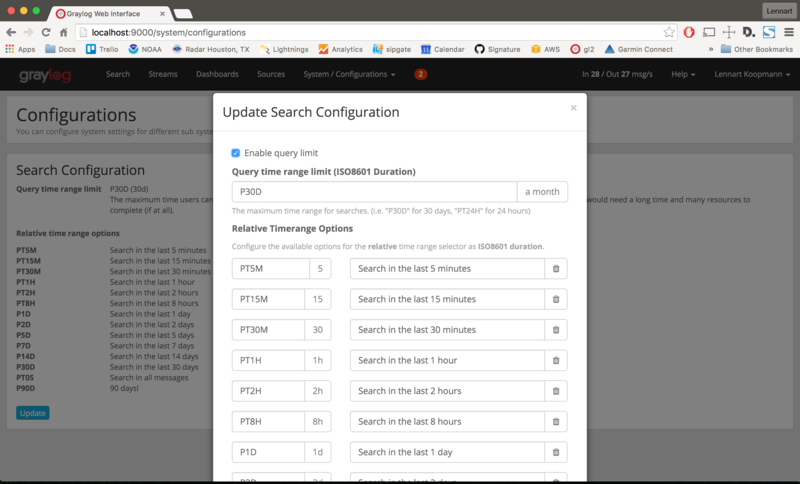 This adds a configuration option to limit the time range for searches. If you manage a team, some of your users on Graylog systems might be unintentionally overloading your Elasticsearch clusters by executing resource-intensive searches over an extended timeframe. If you set the limit to 1 month, for example, no one will be able to search for logs that are older than one month. The relative time range options for search have always been fixed, and you could only limit your time range up to the last 30 days. But what if you wanted to execute a search over the last 3 months? Now you can! You can change or delete the default values and also add new ones. Previously, you had to configure the index rotation and retention settings in the config file, which also required a server restart. Now, you can configure these settings directly from the web interface without requiring a server restart to activate them. As a bonus, the index rotation/retention strategy configuration is now pluggable. If you want to create your own rotation or retention strategy in a plugin, you can now build a custom UI for it as well. The minimum required MongoDB version is now 2.4.